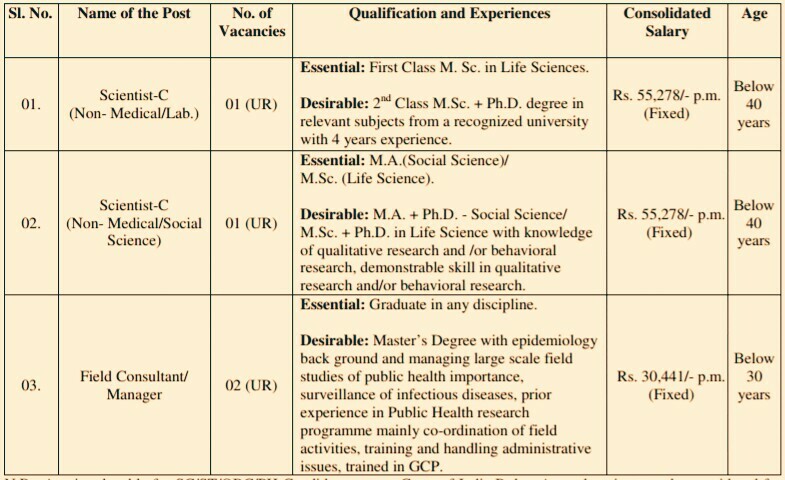 ICMR - National Institute of Cholera & Enteric Diseases, Kolkata, Is Appointing Eligible Candidates To Various Posts In Temporary Basis, So Interested & Eligible People Can Apply For This Job Through Offline Mode, Details Is Given Below. Kindly Do Check Out The Official Advertisement For Accurate Information & Instructions, It's Given Below. Various Vacancies, Check The Image's Below For Detailed Information →12 Vacancies. 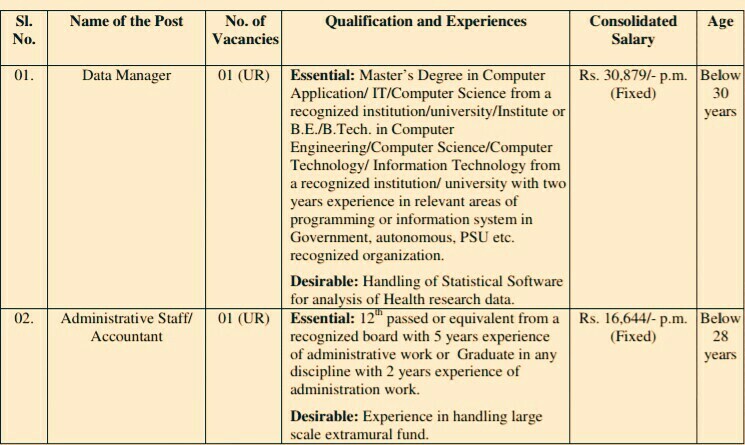 Total Number Of Vacancies →12 ICMR Kolkata Vacancies 2019. (Credit - Official Notification ICMR No- No. 01/SANIPATH/2019-No. 02/SANIPATH/2019 &No. 03/SANIPATH/2019). B. 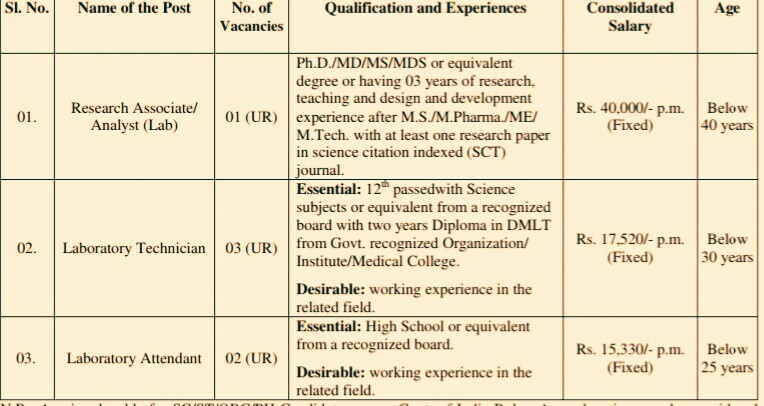 Eligible Criteria For This Job Of ICMR Kolkata 2019. Age Limit →Age is relaxable for SC/ST/OBC/PH Candidates as per Govt. of India Rules. Age relaxation may be considered for experienced candidates in the relevant field. Educational Qualifications →Please Check Out The Image's Above. How To Apply →Candidates fulfilling the above criteria may report on the date of interview along with an application addressed to the Director, ICMR-NICED, Bio-data showing academic record from Matriculation onward, experience, recent passport size photograph pasted on application and attested copies of relevant certificates, for the Walk-In-Interview as per details given below. No TA/DA will be paid for attending the interview. Date Of Walk-in Interview →22nd Of February, 2019. For More Info →You Are Requested To Visit The Official Website Of Theirs For More Information On ICMR, Link Is Here>The Official Website Of ICMR - National Institute of Cholera & Enteric Diseases. Now Apply For This Job Of NICED Recruitment 2019|12 Various Vacancies. Click Here To Download Official Advertisement/Notification. Thank You For Your Support And Love And Keep Visiting Here For More Info On Job In West Bengal And More, Till Then Stay Safe And Blessed.